Tour Local Art Galleries and meet the Artists! 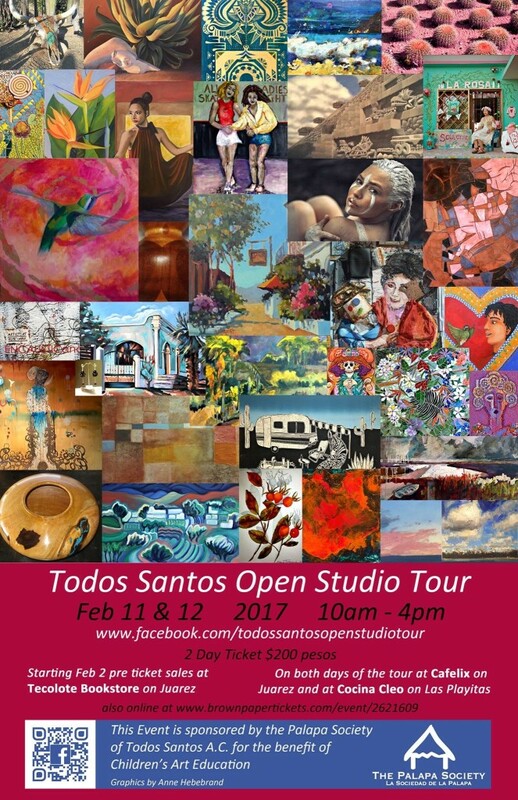 The 8th Annual Todos Santos Open Studio will be held on the weekend of Feb 11 & 12, from 10 am to 4 pm, with proceeds to benefit the children’s art program at the Palapa Society of Todos Santos, A.C.
Advance ticket sales begin Jan 28th at $10 each and can be purchased in town at the Tecolote Book Store located on Calle Juarez, or ordered online at ts.studiotour@gmail.com or purchased at www.brownpapertickets.com/event/2621609. Tickets can also be purchased from 9 to 3 both event days. The Todos Santos Open Studio Tour draws hundreds of people curious to see working art studios, meet the artists and perhaps have a personal dialogue with them. Visitors are able to meet artists in their studios and purchase their art. Participating artists include painters, sculptors, photographers, muralists, plein air painters, encaustic artists, jewelers, printmakers, collage artists, potters and wood turners. For more information please visit www.facebook.com/todossantosopenstudiotour.